McIntosh had added a new SACD/CD transport to its lineup. The MCT500 offers digital output only; there's no internal digital-to-analog converter. The output options are XLR, coaxial, optical, and McIntosh's proprietary MCT connector--which allows you to send high-resolution SACD audio to compatible McIntosh electronics. The player also supports the following file formats via disc or USB: AAC, AIFF, ALAC, DSD (up to DSD128), FLAC, MP3, WAV (up to 24-bit/192-kHz), and WMA. The MCT500 will be available this month for $4,500. 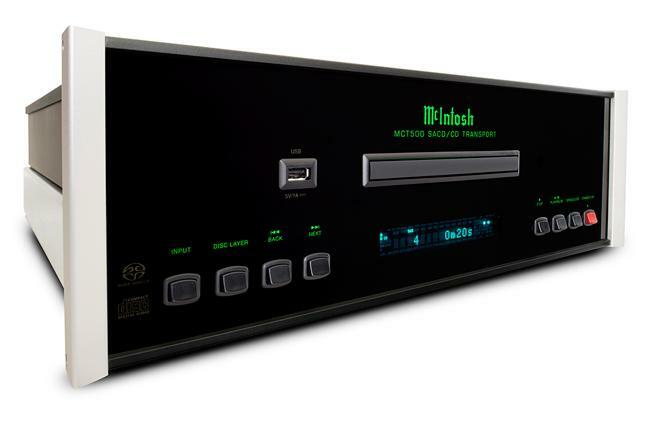 McIntosh is proud to announce the MCT500 SACD/CD Transport. The MCT500 is a digital-only unit and features four digital outputs: industry standard balanced, coax and optical outputs plus our exclusive MCT connector. To enjoy CDs, it can be paired with any product that has standard digital inputs and a digital-to-analog converter (DAC). For SACD playback, the MCT500's proprietary MCT output needs to be connected (via the included cable) to a McIntosh product with an MCT input. This includes select McIntosh preamplifiers and integrated amplifiers. When an MCT connection is made, a secure digital connection is created, allowing for the playback of the high-definition audio found on SACDs. Regular CDs can also be played over the MCT connection. All common disc types can be played on the MCT500, including SACD, CD, CD-R/RW and DVD-R. A USB input is conveniently located on the front panel for easy access. In addition to store-bought CDs and SACDs, popular file formats such as AAC, AIFF, ALAC, DSD (up to DSD128), FLAC, MP3, WAV (up to 24-bit/192-kHz) and WMA can be played from user-generated CD or DVD Data Discs and USB flash drives. Disc handling is smooth and quiet, thanks to an advanced disc transport with a precision die-cast aluminum tray. An advanced digital servo provides fast, quiet and accurate operation. A disc's audio data is read at twice the normal rate, ensuring better disc tracking and error correction processing. Orders for the MCT500 can now be placed with Authorized McIntosh dealers with shipping expected to begin in February. Suggested retail price (VAT, shipping and any customs duties related to current standards of individual countries are excluded): $4,500 USD. • McIntosh Debuts MC611 Mono-block Amplifier at HomeTheaterReview.com.